Definition at line 93 of file tlhelp32.h. Definition at line 94 of file tlhelp32.h. Referenced by IntGetImageBase(), test_module(), test_process(), and test_thread(). Definition at line 97 of file tlhelp32.h. Referenced by Module32First(), and Module32Next(). Definition at line 101 of file tlhelp32.h. Definition at line 99 of file tlhelp32.h. 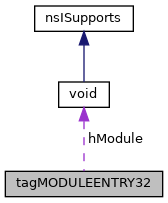 Referenced by IntGetImageBase(), Module32First(), Module32Next(), and test_module(). Definition at line 100 of file tlhelp32.h. Referenced by Module32First(), Module32Next(), and test_module(). Definition at line 98 of file tlhelp32.h. Definition at line 103 of file tlhelp32.h. Definition at line 102 of file tlhelp32.h. Definition at line 95 of file tlhelp32.h. Definition at line 96 of file tlhelp32.h.